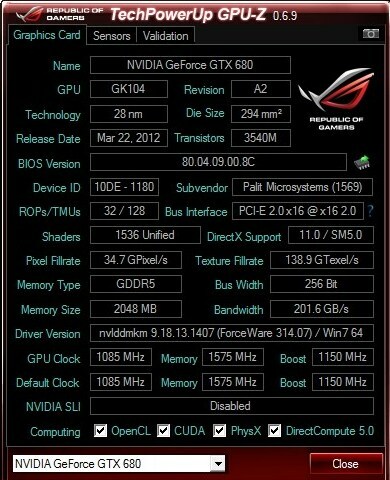 TechPowerUp company announced the availability of a new version of GPU-Z 0.6.9. This useful tool is designed to collect and display the complete information about the video card installed on your computer. The program supports chipsets from leading manufacturers NVIDIA and ATI, and allows the user in a matter of seconds to get the necessary information such as the model of GPU, version of the BIOS, the type and amount of RAM, driver version, supported version of DirectX, and more. Some features, such as the clock speed and CPU temperature, fan speed, system load and voltage are displayed in the form of visual graphics, updated in real time, allowing you to use the utility for troubleshooting. If you want to save your information for future in-depth analysis and study, use the button with the image of the camera in the upper right corner of the screen to create a neat screenshot. You will also certainly prove useful option «Log to file», which would test the graphics performance at different levels of load and store test results to a file. The proposed assembly boasts an expanded list of supported hardware. Estimate of the application can now holds the following graphics cards AMD Radeon HD 8870M, NVIDIA GeForce GTX 650 Ti Boost, GT 415 and GT 750M. The application interface has also undergone a minor revision. For example, attention is invited to pop a few extra tips that will facilitate your familiarity with GPU-Z. For example, hover your cursor over a small icon to the right of the display version of the BIOS and you will know that this useful button to save the current settings and load BIOS. Button to test PCI Express Render Test is now also available as a separate icon. The application works with the operating systems Windows XP, Vista and Windows 7 and is available for download at the developer’s site: http://www.techpowerup.com.